The labor shortage in our industry is no secret. One of the ways Haselden contends with this issue is to encourage the next generation of workers to enter the construction industry! 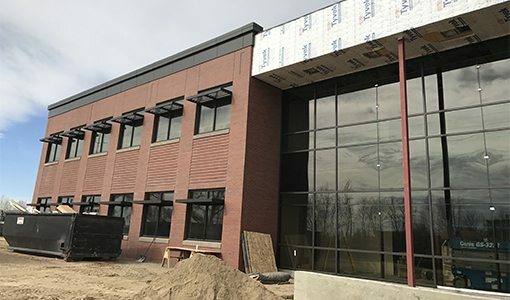 There are many different ways that we do this—careers fairs at colleges, internships, Colorado Construction Career Days, having kids attending the beam signing ceremonies when we’re building their schools . 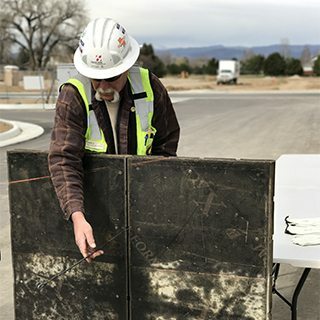 . . and participating in the AGC Colorado Construction Career Connection program. 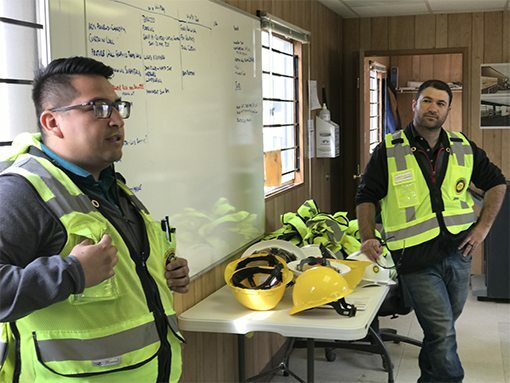 Haselden Project Engineer Luis Rodriguez (left) and Haselden Superintendent Jeb Bair (right) talk to the the students from Thompson Valley High School before heading out for the site tour. What Is the Construction Career Connection Program? Launched with the 2017-2018 school year, the Construction Career Connection program is educational for both the administration and the students at high schools. For the teachers and guidance counselors, it provides information on the myriad career paths available in the construction industry, from a skilled trade (e.g., plumber, welder, electrician) to construction management (e.g., project manager, estimator, superintendent) to virtual design or safety. 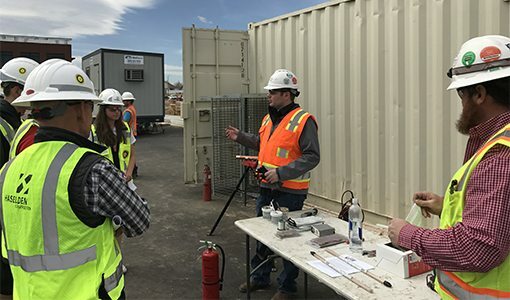 The students reap the benefits of receiving hands-on experience, touring active construction sites, and speaking to men and women in the field. Yesterday Haselden hosted its third jobsite tour for the Construction Career Connection program. 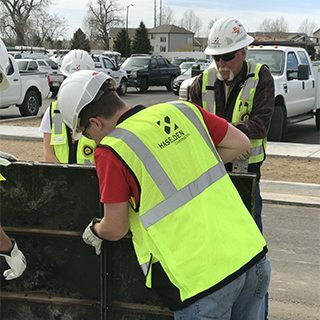 Students from Thompson Valley High School (located in Loveland) were bussed to our Larimer County Administration Building project site (also in Loveland), arriving around 9am. They each received PPE (hardhat, safety glasses, and safety vest) to wear for the day and were briefed on safety procedures to follow while on an active construction site. The kids got a tour of the site, followed by rotations to three stations. On this day, they learned about concrete and virtual design and construction with Haselden, and plumbing with Linds Plumbing and Heating. The first stop was concrete. Haselden Assistant Superintendent Mike Gebauer discussed the many site conditions that must be taken into consideration for a pour, and showed the students how concrete forms work – how they connect, how they create different shapes, what sizes they come in, and how to prep them for use. The discussion on preparing the forms and what lubricant is used now versus years ago led to a discussion on stormwater management. You never know where the conversations in these break-out groups will lead! The kids were able to put on gloves and practice assembling the forms themselves. The group then learned how to calculate how many cubic yards of concrete to order based on the area of the wall, column, pad, etc. to be poured. The next stop was a virtual design and construction demonstration in the jobsite trailer. 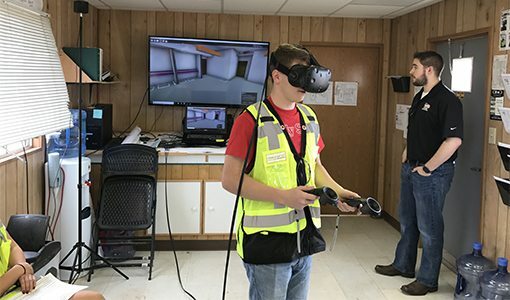 Haselden Senior VDC Specialist Zach Hanover walked everyone through a virtual model of the building on the screen, then the students used the virtual reality goggles to tour the facility. Zach demonstrated how the building transformed from a 2D drawing, to a 3D drawing, to a 3D rendering that could be used in conjunction with the virtual reality goggles. The last stop for the students was to learn about plumbing with Linds Plumbing and Heating. The students gained an understanding of the career trajectory and opportunities for a plumber, then learned how to join copper pipe. They could even try their own hand at applying flux and soldering! This program is still in its infancy. Right now, there are 11 schools participating, but they’re hoping to add up to 11 more for the 2018-2019 academic year! 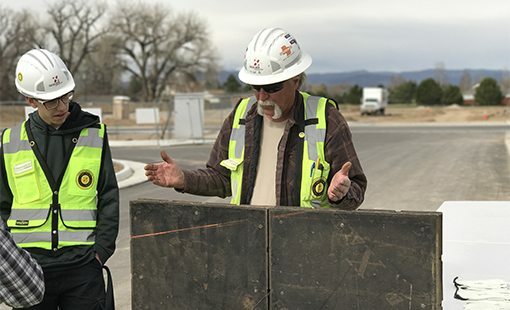 This is the second event Haselden’s Larimer County Administration Building jobsite has hosted, and our Laurel Cherry Creek project has hosted an event as well. We’re hoping to see lots of these kids as interns and CMaPP participants at Haselden in the coming years!